How do I use the ColorShot Digital Photo Printer? What type of instant color film does the ColorShot Digital Photo Printer require? How should Spectra Platinum Film be stored? What software drivers are available for the ColorShot Digital Photo Printer? What are the advantages of the ColorShot Digital Photo Printer over color inkjet printers, making it ideal for professional applications? Setting up the ColorShot is quite simple. For desktop or laboratory use, plug-in the included universal power supply into any 110/220 volt, 50/60Hz AC power outlet. The power supply automatically senses the power voltage; no settings need to be changed. For mobile use, plug-in the optional ColorShot Cigarette-Lighter Car Adapter into the 12-volt cigarette-lighter socket of a car or other vehicle. Next, connect the included parallel port cable to any desktop or notebook PC's parallel port socket (DB-25 female connector). In this manner, the ColorShot can be used worldwide with a variety of PCs and other devices. The ColorShot Digital Photo Printer uses a 10-pack of commonly available Polaroid Spectra Platinum Instant Color Film. According to Polaroid, Platinum film is the highest quality instant film ever made. This film has consistent high quality and is specially designed to bring more color and greater sharpness to instant color prints. This is a general purpose, high speed, medium contrast, integral film for high definition instant color prints. Spectra Platinum Film should be stored in a cool, dry place. It may be stored in a refrigerator, but it should NEVER BE FROZEN. It should be taken out of the refrigerator at least an hour before it is used, allowing it to warm up to room temperature before use. The film should always be kept in its carton until it is ready to be used. The most important part of the film package is the foil, which seals out harmful humidity. The ColorShot Digital Photo Printer is fully supported with software drivers for Windows 95/98 and Linux. They are available for download here. Software drivers for DOS, Windows NT, and Windows 2000 are in development. In addition, a comprehensive Developer Kit is available for porting ColorShot drivers to other operating systems and/or embedded devices. Prints glossy, continuous-tone color images. The printed image is dot-dithered, which may not produce an accurate color representation, nor is the color-tone continuous. 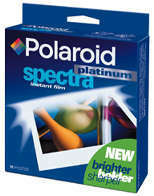 Spectra Platinum film has a long shelf life. Inkjet cartridges often dry out. The cost per print is independent of the image content. Images with more color or darkness use up more ink. Each slide of instant color film is self-contained; there is no ink or toner that can run out. The ink may run out while in the middle of a print job. The ColorShot Digital Photo Printer is smaller and better suited for mobile applications and embedded environments. Inkjet printers are bulky and have exposed elements, such as the paper feed. The ColorShot Digital Photo Printer requires only instant color film. Inkjet printers require paper and ink cartridges.